One of my former clients told me, before she was my client, that she didn’t like soup. I thought that was an odd thing not to like. I mean…soup. Kind of broad isn’t it? In the three years that I cooked for her, I think she grew to like soup. I hope she did because I certainly made a lot of them for her and her husband. I was careful about not doing them too often for a main course and if I did, I was sure to stick with things I knew she loved. I used to think I didn’t like fruit soups. Being more of a savory person, I would really never choose to have a soup be sweet. If I want something sweet, I will wait for dessert – or so my thinking went. While I was planning last weekend’s five course dinner for boys, I came across this recipe for melon soup. The appetizer, salad, and main courses were going to be quite savory, why not a sweet soup for some variety? And why not use another recipe from the genius that is The Millenium Cookbook? 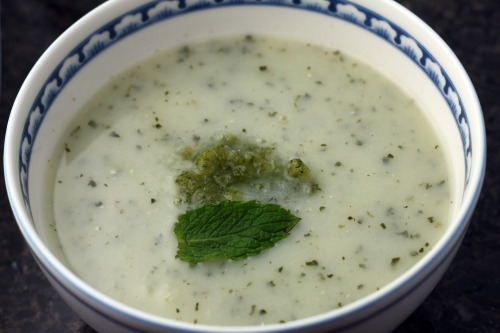 In that book, there are four recipes for cold soups and three of them come with partner recipes for flavor enhancing ices. The one I chose, Sharlyn Melon Soup, suggests you make Cucumber Chile Ice to scoop on top. This is what sealed the deal for me. I knew the soup wouldn’t be too sweet when topped with a cucumber and citrus spiked ice. Sharlyn is a type of melon that is similar to a honeydew. I couldn’t find one but found an heirloom melon instead that had green flesh. I think green looks best with the soup although an orange melon would be fine. And by all means, use honeydew if that is all you can find. I put the ice in an 8×8 pan to freeze and just let it soften enough to be scoopable when I went to serve it. There was much more than I needed for the soup and I had to dump the extra. Next time, I will put it into ice cube containers and fill them only half full. That is the perfect size for the soup and you can always use the extra for a pitcher of mojitos! Side note: I just got off the phone with my brother. He told me that, of all the things I made for that dinner, the soup was the favorite of the guys. I made some really good food, if I do say so myself, so best is saying something! The recipe in the book is vegan. I chose to use honey so therefore mine was not. I give both options below. In a large bowl, combine all the ingredients except the garnish and mix with a fork to break up and distribute the tofu. In a blender, blend the mixture in batches until smooth. Refrigerate for at least 2 hours and up to 1 day. Top each serving with a small scoop (or ice cube) of Cucumber Chile Ice. At serving time, remove the tray from the freezer and scrape the ice with the tines of a fork to flake off the ice crystals. i have to say i kind of get ‘not being a soup person’. i need to chomp on things to feel like i really ate something. If it comes with a chunk of crusty whole grain bread, then we can talk ;) however… i think all of these flavors look like such a tasty appetizer. This group of boys lucked out! My girlfriend also claimed not to like soup when I met her. As it turns out she doesn’t like pureed soups, but will gladly eat a hearty minestrone or lentil soup, for example. This soup isn’t the kind of think I would order on a menu, but given the rave reviews and how good the rest of your food looks I’m intruiged! I’ll have to try it once the weather warms up down here. This sounds great for summer. The cucumber chile ice seals the deal for me too! This sounds like a really interesting soup! Especially the cucumber chile ice on top. I didn’t used to like soup either haha and yes it is quite broad. I guess I’d never really come across soup I liked. I’ve made a lot of soups in the past couple of years but have only come across a couple that I really like. Of course I’m talking about healthyish soups, not ones full of cream which I would most likely find delicious. I have a bunch of cucs- so I am going to try this over the weekend. Thanks!